During the past decade, the DOJ has increasingly relied on Deferred Prosecution Agreements ("DPAs") and Non-Prosecution Agreements ("NPAs") to resolve allegations of corporate criminal misconduct. DPAs and NPAs occupy a middle ground between a guilty plea that results in a company's criminal conviction and a declination that leaves the matter to a civil or regulatory resolution. In 2010 and 2011 alone, the DOJ and the SEC have entered 69 such agreements with companies, extracting a staggering $7.6 billion in corporate payouts with 5 settlements at $500 million or more and 13 settlements topping $200 million. Although these agreements can help a company stave off some of the worst consequences of a criminal indictment, they are not quick-fix solutions. In addition to a hefty financial penalty, DPAs and NPAs often require extensive compliance and cooperation obligations and can result in significant future costs and risks. Given that reality, a company facing a government investigation needs to craft a comprehensive strategy for achieving a settlement agreement on acceptable terms while educating its senior leadership on the potential long-term consequences of entering into a DPA or NPA. 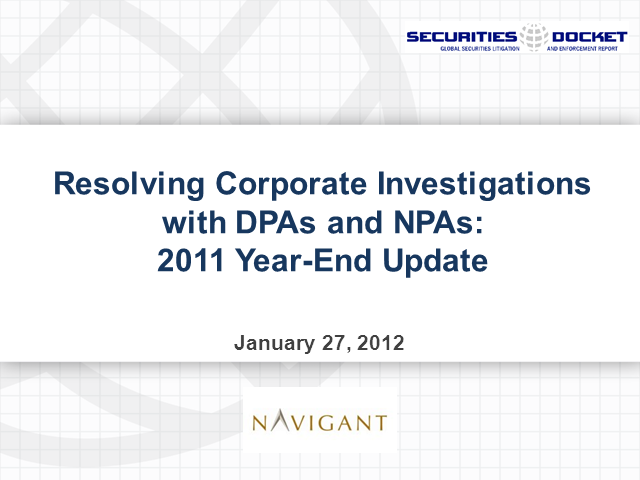 In this webcast, practitioners with decades of experience with DPAs/NPAs, corporate monitorships, internal investigations, and compliance programs will discuss the life cycle of a DPA or NPA, including how to set the stage before settlement discussions with the government begin, how to successfully negotiate with the government for the best outcome, how to foster a cooperative relationship with a corporate monitor, and how to mitigate the potential collateral consequences of settlement agreements.